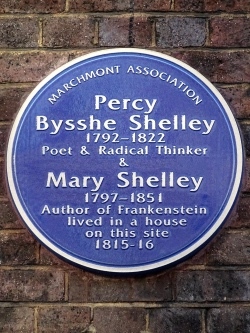 Following their return to England in September 1814 after their European elopement (they were forced to return due to a lack of funds), Mary Shelley and her lover Percy Bysshe Shelley lived in a couple of London properties including one on this site at 87 Marchmont Street in Somers Town. The couple lived in the Marchmont Street premises, not far from where Shelley had grown up, from 1815-16 with Mary’s step-sister (and possibly by this time Percy’s lover) Claire Clairmont. The landlady’s name was apparently a Mrs Harbottle. In January of the second year they were in the lodgings, their son William “Willmouse” was born. The group left the property in May, 1816, to join with Lord Byron in Lake Geneva. It was on this trip that Shelley started writing her famous book Frankenstein: or, The Modern Prometheus. The house in which the Shelley’s had lived – then number 26 – was demolished in 1904. A blue plaque was placed upon the property 2009 by a residents and business group known as the Marchmont Association. Correction: This article originally said Mary Shelley wrote Frankenstein on the trip to Lake Geneva. She actually started writing it as a short story there but it was completed over a longer period which extended into 1817 (with publication initially in 1818). Credited as “the man who invented Christmas”, Victorian author Charles Dickens’ featured Christmas celebrations in many of his works – but none more so than in his famous story, A Christmas Carol. Published 172 years ago this December, the five part morality tale centres on the miserly Londoner Ebenezer Scrooge who, following several ghostly visitations by the likes of the Ghosts of Christmas Past, Present and Yet to Come, becomes a changed man and recaptures the essence of what Christmas is all about. The book – whose characters (said to have been partly based on people he knew in real life) also include the abused clerk Bob Cratchit and his ever positive youngest son, Tiny Tim – is based in London. 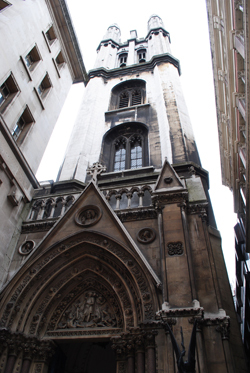 Among key locations mentioned in the book is Scrooge’s counting house, said to have been located in a courtyard off Cornhill (it’s been suggested this is Newman’s Court, thanks to a reference to a church tower, believed to be St Michael’s Cornhill – pictured), the home of Scrooge (it has been speculated this was located in Lime Street), and the home in Camden Town where the Cratchits celebrate their Christmas (perhaps based on one of Dickens’ childhood homes in Bayham Street). 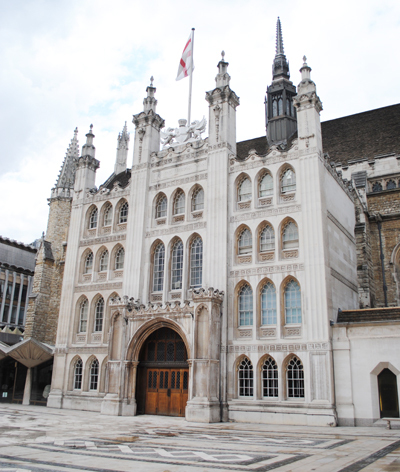 City of London institutions like the home of the Lord Mayor, Mansion House, and the Royal Exchange are also mentioned. The book, which apparently only took Dickens six weeks to write while he was living at 1 Devonshire Terrace in Marylebone, was first published on 19th December, 1843, by London-based firm Chapman & Hall. Based at 186 Strand, they published many of Dickens’ works – everything from The Old Curiosity Shop to Martin Chuzzlewit – along with those of authors such as William Makepeace Thackeray and Elizabeth Barrett Browning. A Christmas Carol‘s first print run of 6,000 sold out any Christmas Eve that same year and sales continued to be strong into the following year. Despite its warm reception by critics and popularity among the public, the book’s profits were somewhat disappointing for Dickens who had hoped to pay off his debts (he also lost out when he took on some pirates who printed their own version two months after its publication; having hauled them to court Dickens was apparently left to pay costs when they declared bankruptcy). Dickens would later give some public readings of the book, most notably as a benefit for the Great Ormond Street Hospital for Sick Children (his last public reading of the book took place at St James’s Hall in London on 15th March, 1870, just three months before his death). The book, which has apparently never been out of print, went on to become something of a Christmas classic and has been adapted into various films, theatre productions, radio plays and TV shows (one of our favourites is The Muppet Christmas Carol, dating from 1992). 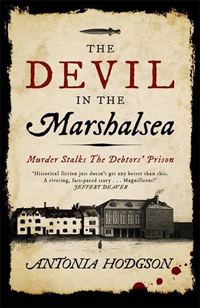 A murder-mystery set among the desperate and dangerous denizens of London’s Marshalsea Prison in 1727, The Devil in Marshalsea tells the story of lad-about-town Tom Hawkins who is tossed into the notorious prison for debt. Hawkins’ only chance of escape is to find the killer of one Captain Roberts, who died in the jail before his arrival, and it’s a task that brings him into conflict with, and under the suspicion of, many within the prison walls. There’s plenty of historical detail and the book delivers an insightful look into what life in Marshalsea would have been like – although as Hodgson points out in an historical note at the start, this is not the Marshalsea of Charles Dickens’ Little Dorrit – that wasn’t opened until 1800 on a different site while this one was located between Mermaid Court and what is now Newcomen Street in Southwark. The characters are largely based on actual people – Hodgson goes to the trouble to describe the background to each in some explanatory endnotes – and their stories criss-cross the main narrative. There’s plenty of twists along the way and the story plunges on at a cracking pace as Hawkins has to confront his worst fears and struggles to discern who is friend and who is foe in a world where everyone appears to be driven by their most base desires. An enlightening read and, as is the case with a good murder-mystery, hard to put down. A terrific debut. To buy this book, follow this link The Devil in the Marshalsea . In JM Barrie’s 1911 novel, Peter and Wendy (based on the stage play Peter Pan; or, the Boy Who Wouldn’t Grow Up), the adventure begins when Peter Pan visits the home of the Darling family. 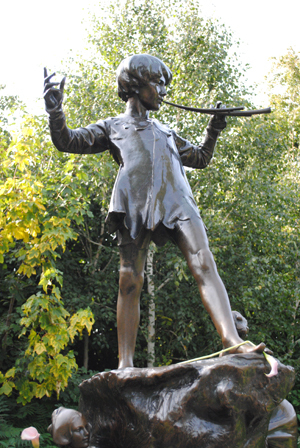 Peter Pan is most famously associated with Kensington Gardens – it’s here that we are first introduced to the character of Peter in the book Peter Pan in Kensington Gardens (in fact there’s a rather famous statue of him there to this day, pictured above) – it’s most often assumed that the Darling’s house must be nearby. But, in fact, the book Peter and Wendy never states where the Darlings’ house is located exactly – just that it is at number 14 in the street in which they live – while in the 1904 play the address is given as “a rather depressed street” in Bloomsbury. Barrie explains that he placed the Darlings’ house in Bloomsbury because Mr Roget (of Thesaurus fame) once lived there and “we whom he has helped to wend our way through life have always wanted to pay him a little compliment”. Worth noting, however, is a property at 31 Kensington Park Gardens. Once the home of the Llewellyn Davies family, family friend Barrie was a frequent visitor here and in fact went on to adopt the five Llewellyn Davies children following the death of their parents in the early 1900s. The property, which is divided into a series of flats, is, as a result, said to have been something of a model for the Darling’s house. Barrie, himself, meanwhile, owned a house at 100 Bayswater Road – not far from Kensington Gardens where he first meet the Llewellyn Davies family – but, interestingly, had previously lived in Bloomsbury. The house is marked with a blue plaque. Another Peter Pan-related address we have to mention is that of the Great Ormond Street Hospital for Children to which Barrie gave the rights to receive royalties from Peter Pan in perpetuity. You can arrange for a tour of the hospital’s Peter Pan-related memorabilia. For more on the story behind the writing of Peter Pan, see Andrew Birkin’s book, J.M.Barrie and the Lost Boys . The address might not immediately ring a bell but it will when we tell you this was the home of London’s most famous bear, Paddington. First appearing in A Bear Called Paddington published on 13th October, 1958, Paddington Bear was the brainchild of Michael Bond, who was apparently inspired a couple of years earlier when he spotted a lonely teddy bear sitting on a shop shelf in a store near Paddington Station (a bear which he subsequently bought and gave to his wife as a Christmas present). 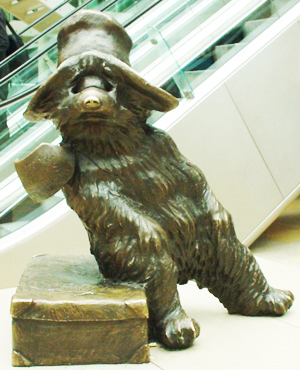 In the books, Paddington – who is typically depicted wearing a blue duffel coat, old hat and Wellington boots – was found at Paddington Railway Station by the Brown family with a note asking that he be looked after (he had been a stowaway on board a ship from Peru, put their by his Aunt Lucy who had gone to a retirement home in Lima). Naming him Paddington after being unable to say his Peruvian name (it turns out later to be Pastuso), the family take the bear back to their large semi-detacted home at 32 Windsor Gardens, just around the corner from the station (his room ends up being located at the top of the house). A Windsor Gardens does actually exist but it apparently has no connection with the Browns’ address which is said to have been wholly imaginary. The real Windsor Gardens is a tiny and rather unappealing cul-de-sac off Harrow Road, between Notting Hill and Maida Vale, and doesn’t even have a number 32. Paddington, known for his love of marmalade, went on to appear in 13 books by Bond – selling more than 30 million copies around the world – and has been the subject of numerous other versions and spin-offs and even a couple of TV series. There’s also a movie in the works with a projected release date of Christmas 2014 and he’s also depicted in a statue by Marcus Cornish at Paddington Station. For more on Paddington, see www.paddingtonbear.com. An in-depth examination of the UK’s first “railway murder”, Mr Briggs’ Hat also provides a rich series of snapshots of life in Victorian London, from that of the murdered middle class banker Thomas Briggs to the life of German immigrant tailor Franz Muller – the man accused of his murder – and a countless cast of cab drivers, policemen, and court officers. The scene is set on the first page – the discovery of blood in a train carriage at Hackney Wick Station on the evening of 9th July, 1864 – and from there Colquhoun slowly unfolds the details of the case against an intricate picture of life in London (and briefly, New York) during the latter half of the 19th century. If you’ve read Kate Summerscale’s The Suspicions of Mr Whicher or even Erik Larson’s Thunderstruck (retelling the story of Dr Crippen), you’ll be on familiar ground although this story is perhaps not as compelling as either of those. Yet, like both books, Mr Briggs’ Hat draws back the veil of respectability that shrouds many of the lives of those involved in the story to show the sometimes sordid but always interesting reality beneath. It also does a good job of conveying just how ‘sensational’ this now largely forgotten story this was when it broke and the hysteria which followed. It can be hard to understand the 19th century mindset from out 21st century viewpoint but Mr Briggs’ Hat makes a good job of it. As with books of its ilk, it’s easy to forget that this is a real story and that real lives were dramatically affected by the events it describes. But it’s that fact which also draws you in. • The City of London today kicks off Celebrate the City – four days of mostly free music, art and cultural events.The events include musical performances in many of the City’s churches, walks and talks at various locations around the Square Mile, new exhibitions including Butcher, Baker, Candlestock Maker – 850 years of Livery Company Treasures at the Guildhall Art Gallery, Livery Hall and historic building openings, family entertainment at the Cheapside Street Fayre at Saturday (including free ice-cream and tuk-tuk rides for children) and activities at the Barbican Centre and the Museum of London. The celebrations start in Guildhall Yard (pictured) at 6pm tonight when musicians from the Guildhall School of Music & Drama perform Tchaikovsky’s 1812 Overture, complete with firing cannons. Among the many other highlights will be the chance to play golden street pianos, to join in the Midsummer street part at the climax of the Spitalfields Music Summer Festival, to enjoy a sunset from the Tower Bridge walkways and to see the transformation of St Helen’s Square into a sculpture space. The weekend will also host the Open House Junior Festival, London’s first ever child-friendly City architecture festival. To see detailed listings of what’s on, head to www.visitthecity.co.uk/index.php/celebrate/. • The Museum of London will next week launch its annual community and training dig at Syon Park in Hounslow. The dig, which will be open to school and community groups, will run from 25th June to 7th July and will focus on the area of Sir Richard Wynne’s house. A Parliamentarian, in 1659 he was implicated in a Royalist insurrection and was imprisoned. The house, which featured in the Battle of Brentford when Royalist troops advanced on Parliamentary forces in London in 1641, was later purchased by the Duke of Northumberland and demolished to extend Syon’s parkland. For more, see www.museumoflondon.org.uk. • We couldn’t resist mentioning this one: Westminster City Council has released a top 10 list of the strangest objects people have dumped on London’s streets. They include an inflatable Margaret Thatcher and other inflatable dolls, wedding dresses, stuffed animals and a range of film props. The council say that, on average, enough litter is picked up off Westminster’s streets every two days to fill the entire 864 cubic metres of Marble Arch. They add that if just half of the annual waste collected off the street is recycled properly in the correct bins it would save them nearly £1million. • On Now: Writing Britain: Wastelands to Wonderlands. The major summer exhibition at the British Library, it explores how the last 1,000 years of English literature have been shaped by the country’s places. The exhibition features more than 150 works with highlights including John Lennon’s original lyrics for The Beatles’ song In My Life, JK Rowling’s handwritten draft of Harry Potter and the Philosopher’s Stone, JRR Tolkein’s original artwork for The Hobbit and original manuscripts from the likes of Jane Austen, William Blake, Charlotte Bronte, Arthur Conan Doyle, JG Ballard and Charles Dickens. As part of the exhibition, the Library is inviting people to “Pin-a-Tale” on an interactive map of Britain, that is, take a literary work and pin it on the map along with a description of how the work links with that particular location – head to www.bl.uk/pin-a-tale to take part. The exhibition runs until 25th September. Admission fee applies. For more, see www.bl.uk. • Saffron Hill, Clerkenwell. 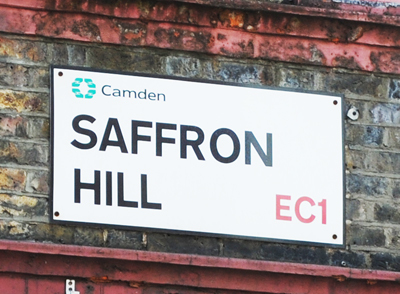 Once a notorious slum akin to St Giles (see last week’s entry) and the city’s Italian Quarter, Saffron Hill is where Fagin and his gang of thieves operate in Oliver Twist and have their den. • Chancery Lane, Holborn. Much of the novel Bleak House is set around this narrow street between High Holborn and Fleet Street – Tom Jarndyce kills himself in a coffee shop here in the novel and Lincoln’s Inn Hall – formerly home of the High Court of Chancery – also features. • The Old Bailey. Some have suggested Dickens worked here as a court reporter although there is no compelling evidence he did so. But the the Old Bailey (the current building dates from the early 20th century, well after Dickens’ death) and Newgate Prison certainly featured in his books – it is here that Fagin is eventually hung in Oliver Twist. • Child & Co’s Bank, Fleet Street. While the present building dates from 1878, Dickens is believed to have used the bank as the model for Tellson’s Bank in A Tale of Two Cities. • St Dunstan-in-the-West, Fleet Street. In David Copperfield, David and his aunt, Betsy Trotwood, make a special trip to see the giants Gog and Magog strike the church bells. It also features in Barnaby Rudge and Dickens dedicated his Christmas story, The Chimes, to the church. • Garden Court and Fountain Court (pictured), Middle Temple. Garden Court is where Pip lived in Great Expectations and where Abel Magwitch turned up to reveal himself as Pip’s benefactor. 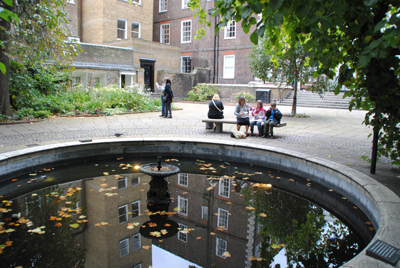 Fountain Court features in Martin Chuzzlewit as the site for the romance of Ruth Pinch and John Westlock. • Golden Square, Soho. Mentioned in Nicholas Nickleby – Nicholas’ uncle, Ralph Nickleby, was thought to live in a previous building at number seven. A Walk Through Charles Dickens’ London . • While, for a quirky look at the city, why not try Ianthe Ruthven’s A Spotters Guide to Animal London?